We identified two variables to represent mechanical energy associated with coastal and offshore water motion: a relative exposure index for the coastal margin and shallow nearshore zones (< 5 m) that summarized wave energy; and a generalization of circulation patterns for deep nearshore and deep and profundal offshore areas. The relative exposure index (REI) is a wind speed, direction, and frequency weighted measure of effective fetch (Keddy 1982). Using the methods and ArcGIS tool developed by Rohweder et al. 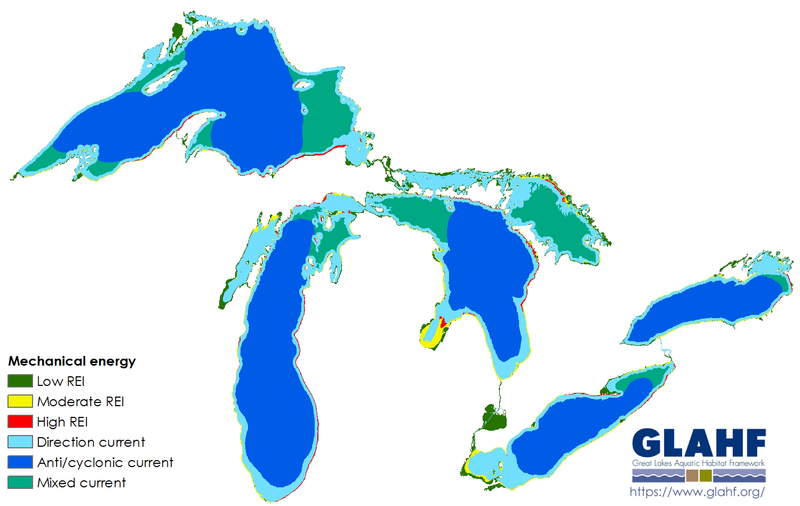 (2012), REI was calculated for each lake applying the wind data summaries for the nearest buoy to a given area of lake, which were then combined into a Great Lakes wide REI map for coastal margin and shallow nearshore zones. We classified REI into low, moderate, and high using natural breaks. For deep nearshore and deep to profundal offshore zones, we summarized published Great Lakes circulation patterns to map general patterns of surface water motion (Sheng and Rao 2006; Prakash et al. 2007; Schwab et al. 2009; Bennington et al. 2010; Beletsky et al. 2013). The directional (alongshore) current was defined as occurring from the 5-m isobaths to either the 30-m isobaths (15 m in Lake Erie) or 5 km from the high resolution shoreline, whichever distance was greater based on a compilation of studies and information describing circulation patterns (Beletsky et al. 1999; Rao and Schwab 2007; Kelly et al. 2015; and C. Troy (Purdue University, pers. comm. 2015). The large scale cyclonic/anti-cyclonic and mixed circulation patterns were mapped from the directional current boundary across the offshore zone using heads-up digitizing.